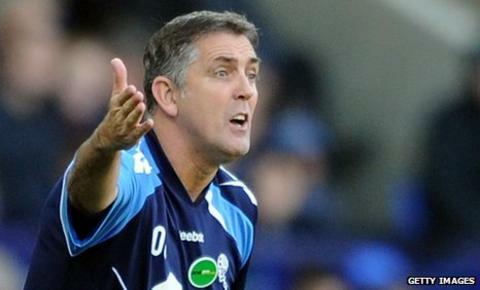 Bolton manager Owen Coyle has warned his squad they are playing for their futures over the rest of the season. Wanderers are five points adrift of safety at the bottom of the Premier League and have "10 to 12" players out of contract next summer. "I can totally understand why my owner would be reluctant to be handing out new contracts - until they are earned," said Coyle. "That in itself should be a huge incentive for those players." Coyle criticised the attitude of his side during the first half of last weekend's 2-1 home defeat by Aston Villa. They head into Saturday's clash with Fulham at Craven Cottage seeking to avoid a fifth straight loss - and a 13th of the campaign. While Coyle concedes that the future of some players may lie away from the Reebok Stadium, he has nonetheless challenged them to prove their worth to prospective employers. He added: "Either you want to be here at a fantastic club, or if you think the grass is greener on the other side, then you play your way into that situation where you will have different offers. "It is two-fold. By not performing, you are not doing yourself justice." Gary Cahill is among those whose contract expires at the end of the season, and Coyle admits there is a chance the England centre-back may be sold during the January transfer window. "Of course, there is a contractual situation and, again, if there is business to be done, then so be it," Coyle said. "If he does move, there is no doubt there will be top clubs clamouring for Gary."